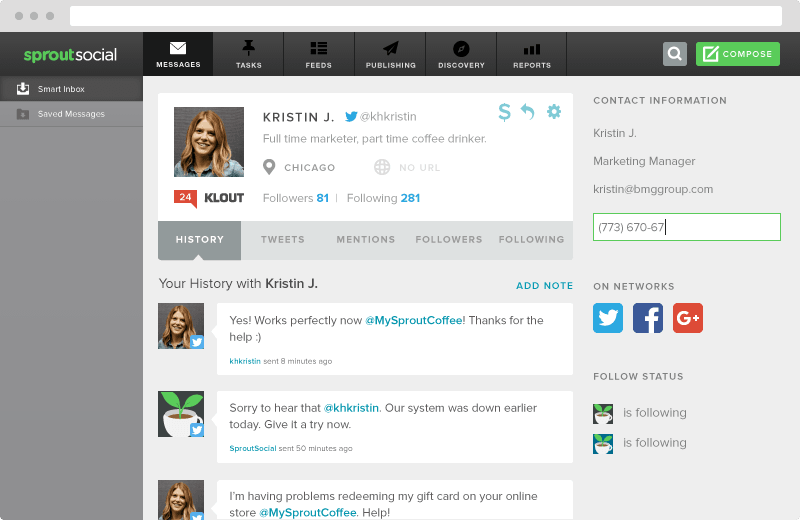 6 Why Choose Sprout Social? Today’s consumers expect more, and nowhere is this more apparent than on social media. Eighty-one percent of consumers say social increased brand accountability, whether by giving customers power (75%), encouraging transparency (70%) or amplifying issues (65%). Social users will unfollow brands if they’re overly promotional (46%), irrelevant (41%), quiet (18%) or unresponsive (15%). And while consumers are hungry for news about products and promotions, they also want social content that educates (59%), entertains (56%) and inspires (49%) them. Consumers are in control, and they crave connection—open, real and empathetic relationships with the brands they love. The numbers don’t lie: 82% of consumers with an emotional connection to a brand will remain loyal. Social media – at the end of the day – is a way to build and deepen one-on-one relationships. As social continues to mature and influence every facet of our lives, the bar for effective strategy raises ever higher. And so do the stakes. A negative social interaction increases the chance of a consumer boycott by 43%. Meanwhile, 71% of consumers would recommend a brand after a positive social interaction. We’ve entered a new era, one where openness, realness and empathy on social are required to capture consumer attention and foster brand loyalty. Ninety-four percent of consumers are likely to stay loyal to brands that provide complete transparency, 86% seek out authenticity when deciding which brands to support, and 80% are more likely to buy from brands that provide personalized experiences. It’s no longer enough for brands to simply show up. Our digital lives are too noisy and cluttered. Connection is key, especially when you consider how social has transformed the buyer journey. Consumers no longer move in a straight line; social has made it easy for them to interact with brands in different ways at numerous touchpoints. This guide will illustrate how brands can use the pillars of openness, realness and empathy to create real connection on social, featuring advice and insight from Sprout Social All Stars, a community of social experts and advocates from around the globe. Every brand has a story—a distillation of its purpose, values and vision. To connect with audiences, brands must find their stories and commit to them clearly and transparently on social. 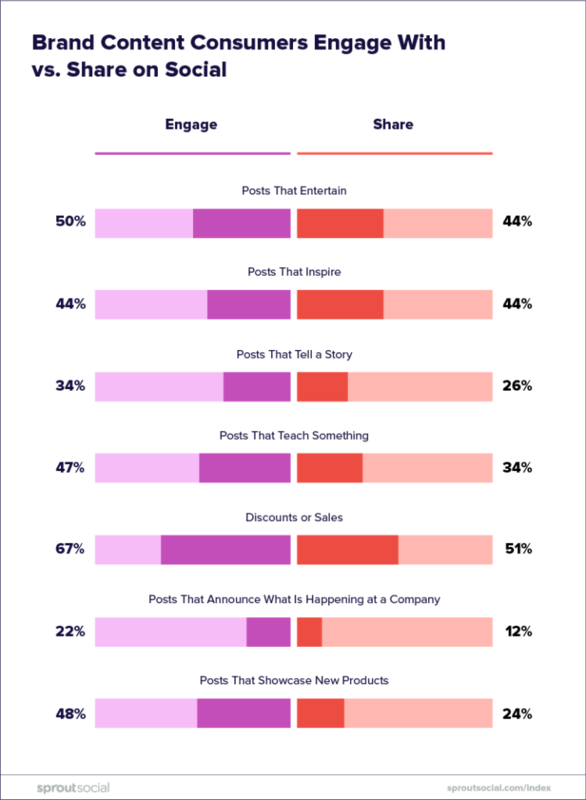 While a majority of consumers want social content related to discounts and sales (72%), as well as new products and services (60%), more than half also want to see posts that teach them something (59%) and entertain them (56%). Forty-nine percent want to see inspirational posts. Educational, entertaining and inspirational content campaigns provide the connection consumers seek from brands, building long-term relationships and brand stories that outlast limited-time promotions and seasonal sales. Consumers see social as a place to interact with friends and family first and foremost, and learn more from brands they care about and trust. But brands must look beyond text on a page. More than half of consumers (58%) prefer visual content, such as graphics, videos and photos. And consumers don’t just want to view visual content, they want to share it. Seventy-four percent of consumers share brand video content on social, especially if the video in question entertains, inspires or conveys knowledge to friends. Ultimately, openness on social media is about brands creating value for audiences in a way that’s honest, transparent and brand-relevant. Openness on social media is sharing about the brand and its evolutions, in real time. Consider the case of Adore Me, a brand that manufactures and sells women’s apparel with a focus on lingerie. Adore Me’s brand story is built on the idea of inclusivity and accessibility for women of all sizes and budgets. When Adore Me discovered social users were asking about modeling opportunities, it ran a contest to find the next face of its brand. Fans were encouraged to post videos to Instagram of them lip synching love songs using the hashtag #SelfLoveNote. The winner of the contest received a modeling contract, photo shoot, all-expenses paid trip to New York City and $1,500 with which to purchase Adore Me products. Not only was the contest a success, garnering more than 500 submissions, it demonstrated Adore Me was willing to put its money where its mouth was. It lived its company values, celebrating body positivity while opening its brand up to fans. Increasingly, being open also means taking a stand on issues brands may have previously tried to avoid. Sixty-six percent of consumers believe it’s important for brands to take public stands on social and political issues, and 58% feel it should happen on social media, making it the channel consumers are most comfortable with for tackling sensitive topics. That said, brands shouldn’t confuse grandstanding with transparency. Consumers believe brands are most credible when speaking to issues that directly impact their customers (47%), employees (40%) or business operations (31%). Brands are comprised of people, not machines—and that’s their strength. Human beings are the cornerstone of any genuine brand experience. Being human – not just operating like a bot, but adding life into every post or tweet through a creative voice. it also means interacting with others and not being a selfish poster (someone who just posts but never responds or comments). In order to connect with audiences, brands must demonstrate they understand what consumers care about and find authentic opportunities to add to their experiences. Brands can start by listening. Social is the world’s greatest focus group, filled to the brim with consumers’ thoughts and opinions. 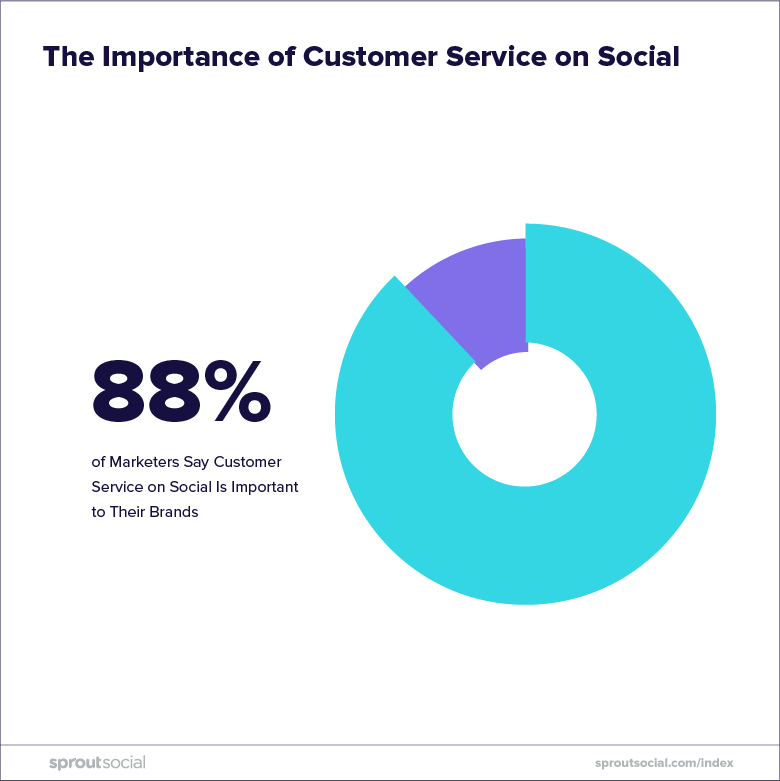 It’s why 86% of brands use social listening to track customer requests, questions and concerns, as well as improve products (25%) and customer service (21%). Beyond tapping into consumer sentiment, putting the people behind a brand center stage can help organizations demonstrate realness. For us, being real means speaking like a human. Yes, we are a brand, but there are people behind it that make it work. The people are the reason our customers love us. While 46% of brands are using influencer marketing on social, the inherent inauthenticity of the arrangement leaves a bad taste in many people’s’ mouths. Only 36% of consumers are more likely to research a product or service if it’s mentioned by an influencer or celebrity. But if a consumer’s friend mentions the same product or service? Sixty-one percent will sit up and take notice. Regular people are relatable, and their opinions and experiences hold more weight with modern consumers. They also have surprising reach. Brand messages reach 561% further when shared by employees on social compared to official brand accounts, and are shared 24 times more frequently. It’s a lesson well-learned by West Monroe Partners. After the consulting firm empowered its staff to advocate for its brand on social media, it noticed website visitors brought in through employees stayed twice as long and were twice as likely to convert. Injecting humanity into a brand generates trust with the buying public. But what makes a brand human? Social interactions don’t happen face to face, making the tone and style of communications essential. According to consumers, brands should be honest (86%), friendly (83%) and helpful (78%) on social. And while humor is attractive to 72% of consumers, less than half want brands to be trendy, politically correct or snarky. It’s all too easy to confuse being real with being “cool,” but they’re far from one and the same. Brands must be true to themselves and their values. Transparent attempts at edginess will do more harm than good. For example, making fun of competitors and using slang are considered more annoying than cool by a majority of consumers. Seeing consumers as distinct persons with unique desires isn’t an option, it’s essential. Building connection with audiences requires brands to acknowledge consumers as individuals and create experiences that feel relevant to them on a personal level. Seventy-two percent of consumers expect brands to understand their unique needs and expectations, with 70% saying a brand’s understanding of their individual needs impacts their loyalty. In fact, 66% of consumers are likely to switch brands if they feel like they’re not treated as individuals. You need to listen to your audience. What issues do they care about? How can you help solve their problems? Even social advertisements should be customized for customers, as 71% of consumers prefer ads tailored to their interests and shopping habits. And while targeted social ads certainly show a level of personalization that appeals to consumer individuality, customer experience is where brands have the greatest opportunities to display empathy. Forty-five percent of consumers reach out on social for customer service, whether because they have a question (57%), an issue with a product or service (45%) or want to praise a brand for its product or service (34%). And what do these individuals expect in a brand’s response? Personalization. Sixty-nine percent of consumers said personalized customer care influences their loyalty to a brand. Not only do they want personalized care, they want it fast. A majority of brands (78%) respond to customer requests within 12 hours, but 38% of consumers expect a response within five. Going further, 64% of consumers expect brands to respond and interact with them live, in real time. The power of responsive, personalized care is something Seneca College understands firsthand. When a staff strike shut down the college, students were understandably distressed. Using social media, Seneca was able to prioritize which students required immediate feedback, and in some cases proactively reach out to students to connect them to counseling for mental health support. Yet empathy isn’t just about customer care, it’s also about community building. Brands must engage consumers and converse with them to fully understand their wants and needs. It’s a truth the City of Las Vegas knows well. The city revamped its social strategy to engage and create dialogue with citizens, getting a better sense of what makes its social audience happy, angry and everything in between. In addition to a 23% and 59% year-over-year increase in engagement on Twitter and Instagram, respectively, the city has positioned itself to better identify and comprehend the wishes of constituents. 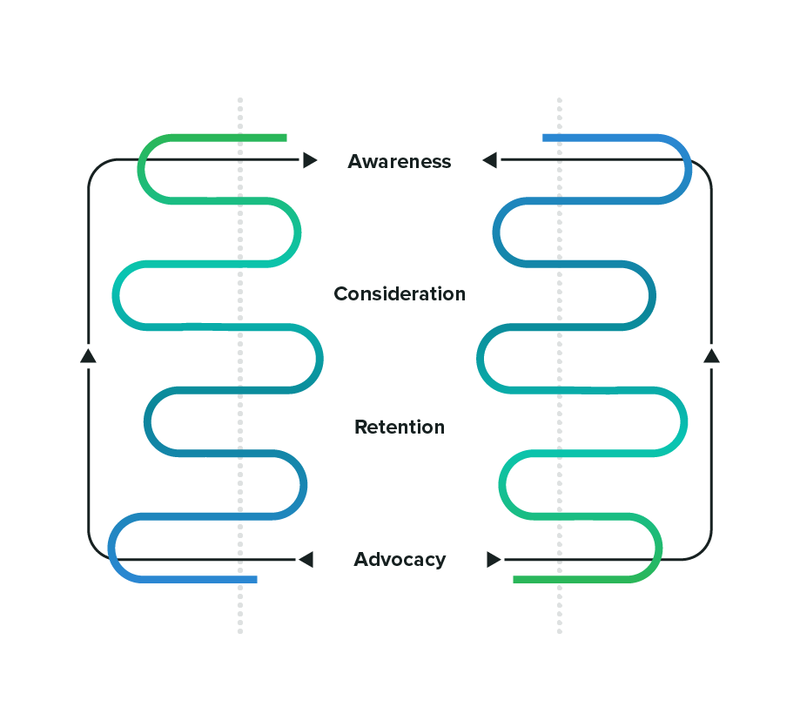 The Sprout Social suite of products, including its advocacy solution Bambu and advanced analytics solution Simply Measured, equips brands with the tools they need to not just compete, but connect. Openness on social is supported through Sprout’s content publishing, campaign management and workflow and collaboration tools. Sprout’s publishing features include intuitive content creation and scheduling tools, as well as a dedicated calendar that provides a comprehensive view of planned content across social channels. 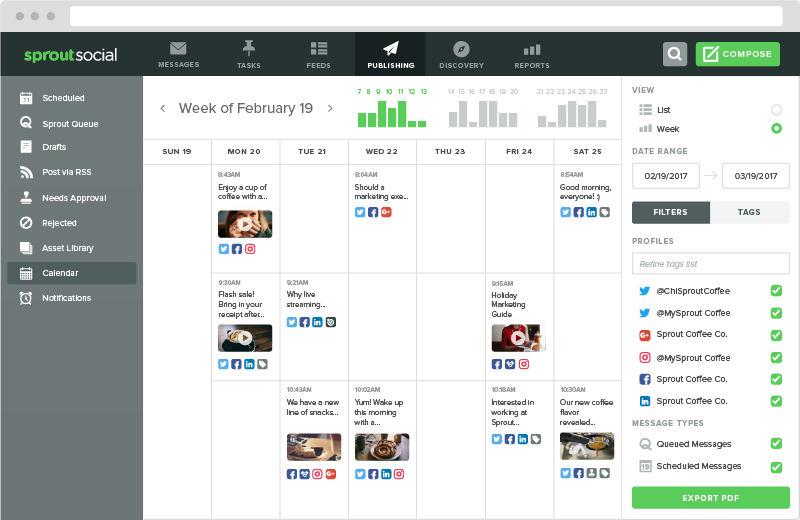 Sprout’s automated scheduling and publishing tools make posting content and capturing audience attention effortless. Features such as ViralPost automatically determine the optimal times to post content for engagement based on brands’ target audiences, adding to Sprout’s organic post targeting functionality. Additionally, through Sprout, brands can efficiently manage all their visual content with a dedicated Asset Library to store, edit and publish on-brand imagery and videos. Brands can easily add filters, text and optimize images for specific social networks as well as preview content before publishing. Planning, launching and evaluating content campaigns through Sprout is simple with the use of tagging. Users can easily apply custom tags to specific pieces of content to quickly organize them and measure campaign performance. Sprout’s user-based publishing permissions grant different levels of access based on a user’s role, making it easy for brands to organize and oversee team publishing. Features such as message approval enable brands to maintain consistent voice while supporting efficient collaboration between different individuals, teams and departments. When consumers want to engage with content, messages can easily be routed to employees for responses using Sprout. 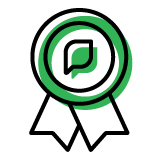 Audit trails allow brands to see who took action on specific messages, and live activity updates in Sprout’s Smart Inbox provide teammates with real-time notifications to prevent response redundancy. Realness on social is reinforced through Sprout’s social listening, analytics and reporting, and advocacy and influencer engagement tools. Sprout and its advanced listening powered by Simply Measured empower brands to comprehensively track and analyze relevant, real-time social conversations. 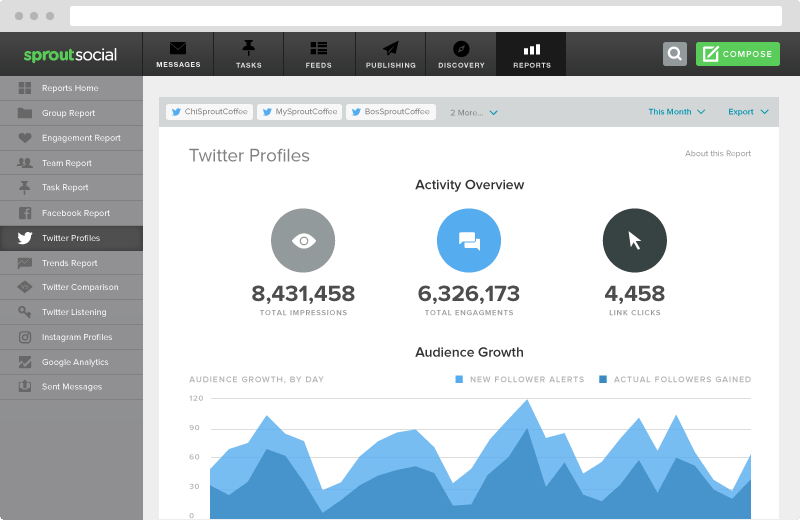 Detailed, easy-to-understand reports provide valuable insights based on keywords, hashtags, topics and other social data. Intuitive listening tools enable brands to build basic and advanced searches without needing to memorize complex syntax or rules logic. Additionally, real-time previews and in-line adjustments make it simple to fine-tune queries and enhance results. Everything from brand sentiment to geolocations can be uncovered and used to inform future campaigns, and competitive analysis allows brands to discover how competing players in their spaces fare in terms of share of voice, social activity and consumer opinion. 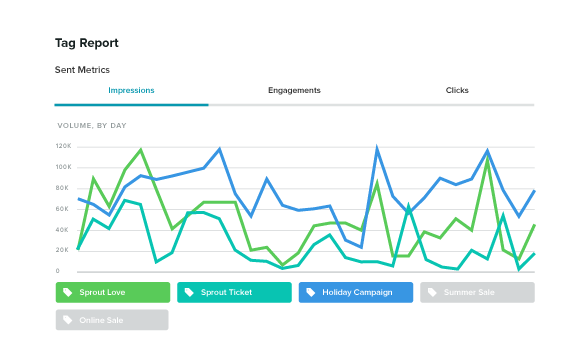 Sprout, along with advanced analytics powered by Simply Measured, provide essential data analysis options for every facet of a brand, across all connected social channels, profiles, date ranges and more. Meanwhile, internal team reports simplify employee performance reviews, providing key KPIs regarding social customer service. Fully customizable reporting makes it easy to build relevant, presentation-ready reports that are specific to a brand and its goals, while existing templates support straightforward performance evaluation for brands as a whole. Custom URL tracking also enables brands to define campaigns and append tracking data to Sprout-posted links for easy identification in Google Analytics. 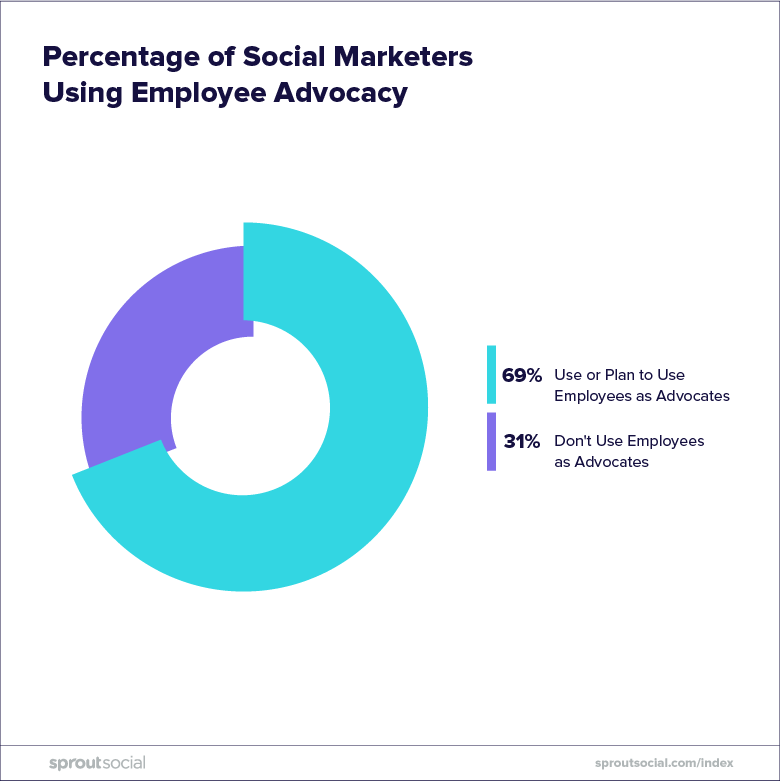 Through Sprout Social’s Bambu product, brands can easily launch employee advocacy programs that allow them to leverage their own team members as online influencers while benchmarking internal activity alongside organic social metrics. 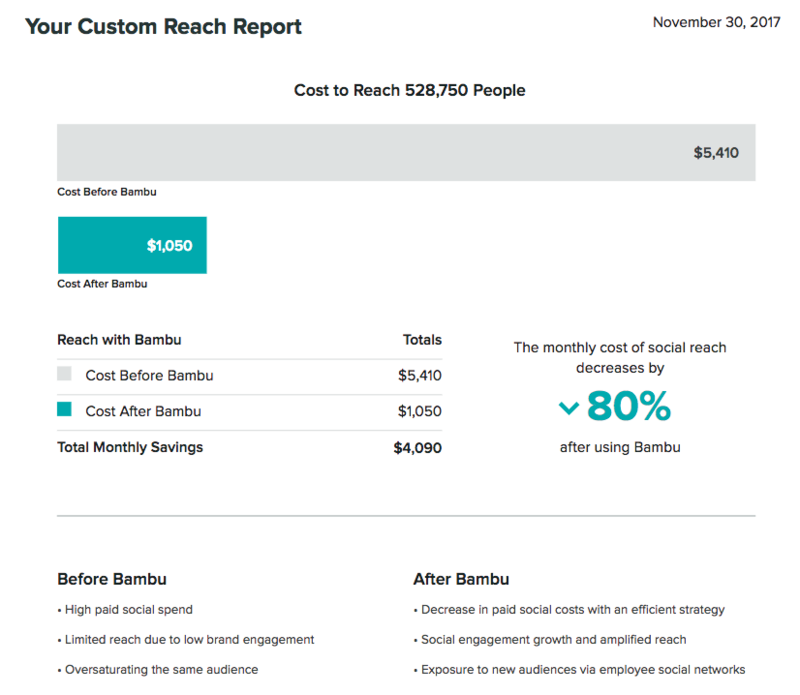 Bambu data can be surfaced inside Sprout’s reporting suite, providing insight into how individuals share content curated from Bambu on their own social networks while keeping teams aligned with shareable reports in a central location. 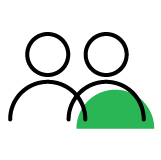 Empathy on social is strengthened through Sprout’s audience engagement, customer care and social CRM tools. 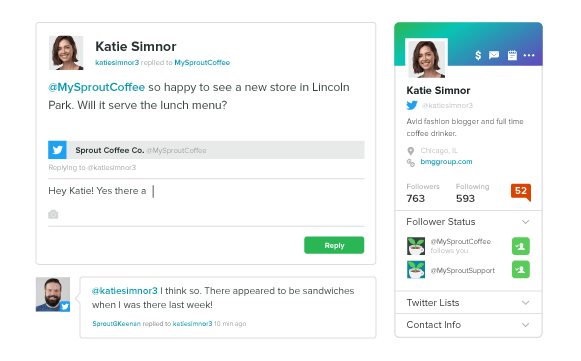 Sprout’s Smart Inbox displays all messages from all connected social profiles in a single stream, making it easy to uncover engagement opportunities, join conversations and respond to customers, as well as tag incoming messages. The Smart Inbox can be filtered based on profile, keyword, message type, custom tags and time period. 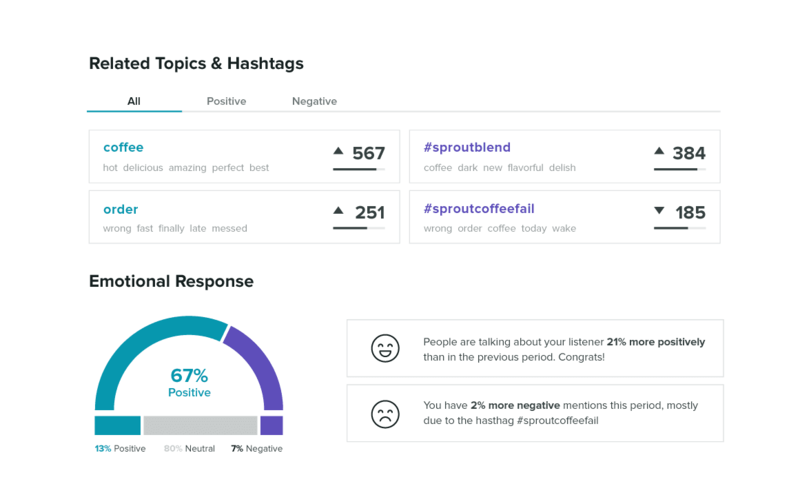 Everything from hashtags to locations can be monitored for engagement opportunities in Sprout, supporting proactive customer care. Brands can assign and manage tasks based on customer messages, mark cases complete and ensure effective collaboration through team-based tools. Brands can easily track response rates and times to measure productivity and improve customer service efficiency, as well as collect and report customer satisfaction data. Additionally, Sprout’s Suggested Replies use machine learning to provide response options, making it easy to manage a large volume of customer service requests. Sprout’s integrated Bot Builder functionality helps brands eliminate repetitive tasks through automated responses that can answer frequently asked customer questions, gather relevant user information for future assistance and seamlessly connect customers to live agents when appropriate. 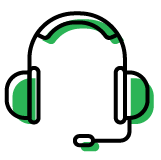 Sprout’s Group structure and permission-based tools make the platform equally simple to use internally or by a third party if customer service is contracted out to a contact center. 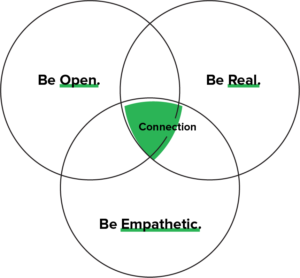 Sprout’s customer relationship management tools enable brands to create a complete customer profile by sharing notes, such as the best time to reach a customer or details from offline interactions. Conversation histories, contact information and other relevant information can be shared across all teams and departments to ensure consistent customer experience no matter who is responding on a brand’s behalf. Sprout also integrates with Zendesk and UserVoice to help social and support teams work across platforms without having to leave their respective dashboards. There’s a reason Sprout has 24,000 happy customers and counting. We are the highest-rated tool on the market in customer satisfaction, customer support, usability and customer retention, according to both Forrester and G2 Crowd. Award-winning service: Personalized, quick and reliable customer support. 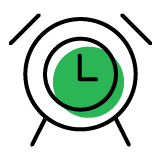 We also offer the fastest time to value in our industry, helping brands get their entire organizations up and running on Sprout in a matter of days instead of weeks or months. Sprout Social is on a mission to help today’s brands create real connection with consumers by giving them the tools they need to be open, real and empathetic on social. Check out our library of customer case studies to see how Sprout Social, along with its Bambu and Simply Measured products, helps transform brands inside and out to succeed on social and achieve desired results. This guide would not have been possible without the advice, insight and expertise of Sprout Social’s amazing customers and advocates, especially the Sprout Social All Stars. If you’re interested in becoming an All Star, you can learn more about the program and its benefits here.